We all trust Jesus. Yet so many in the world fail to do so. This Friday is the Feast of the Sacred Heart, it’s a first Friday, and 3pm is the Great Hour of Mercy (according to St. Faustina). 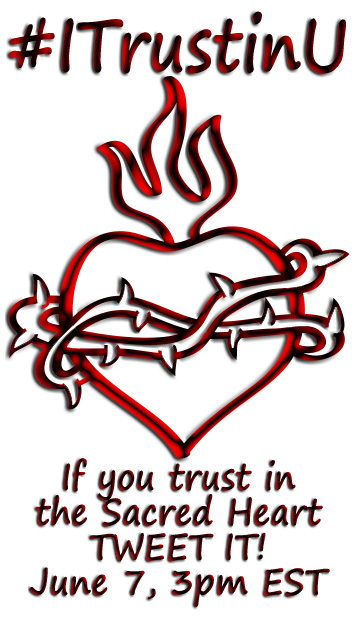 I noticed that the Sacred Heart and the Divine Mercy have a common root, they end their prayers with “I trust in you.” With everything coming together, I thought this would be a great time to storm Twitter with #ITrustinU. Last time with #PrayTheRosary we got just over 4,000 mentions in an hour. I think we can beat that. To help it trend better, please start right at 3pm, if all of a sudden from one minute to the next 500 tweets are sent out with one hastag (#ITrustinU in this case) it can bounce up on twitter’s trending topics right away. Let’s do it at 3pm EDT (New York). For others that’s 9pm Rome time, 2pm Chicago time, 1pm Denver time, and noon Los Angeles time. If you are elsewhere in the world, you’ll have to use Google to do a time conversion. isn’t specifically religious so those who would otherwise ignore it, will click. We Catholics, and especially the younger generation, need to learn how to use social media for the Gospel. If you understand that, skip down and leave a comment. If not, here’s some technical stuff. One way twitter uses to connect people who otherwise may not connect is trending topics. If you are on a computer, these appear on the left of almost every page. If a bunch of people tweet the same thing that has not been tweeted before, it jumps up in the trending topics. Topics are worldwide, by nations, by cities, or personalized based on who you follow. If we can tweet the same thing together we show solidarity and we can help let these other people become aware of it because they see it on trending topics. Every so often, we try to get something solidly Catholic on there. I got involved almost by accident by suggesting #ThanksPontifex on Benedict XVI’s last day. All you need to do is participate by sending a tweet in that hour which includes #ITrustinU. 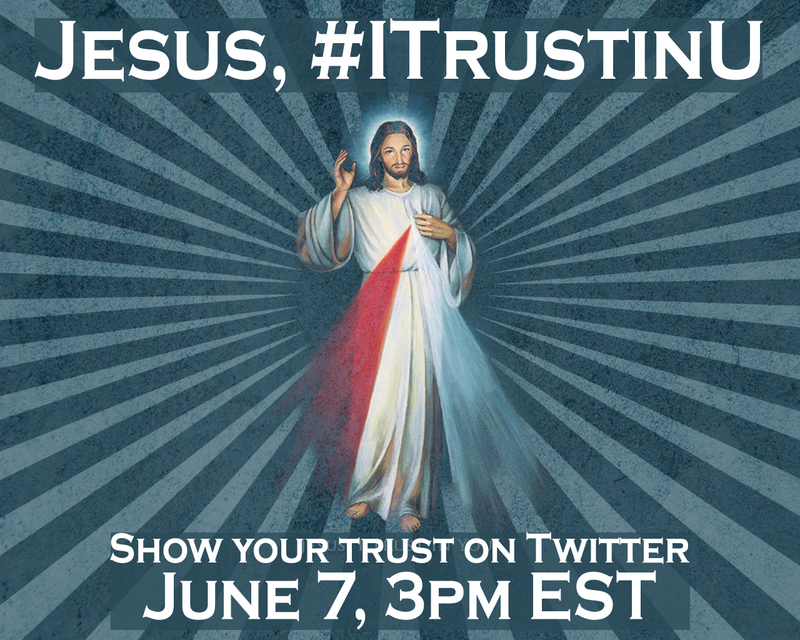 Once you send it, click on #ITrustinU and you’ll see the tweets everyone else is sending so you can retweet them to help again. Please join us.